PANORAMIC VIEW, RELAX, WI-FI, BIKE AND HIKING, FINE-FOOD, WINE AND MORE. 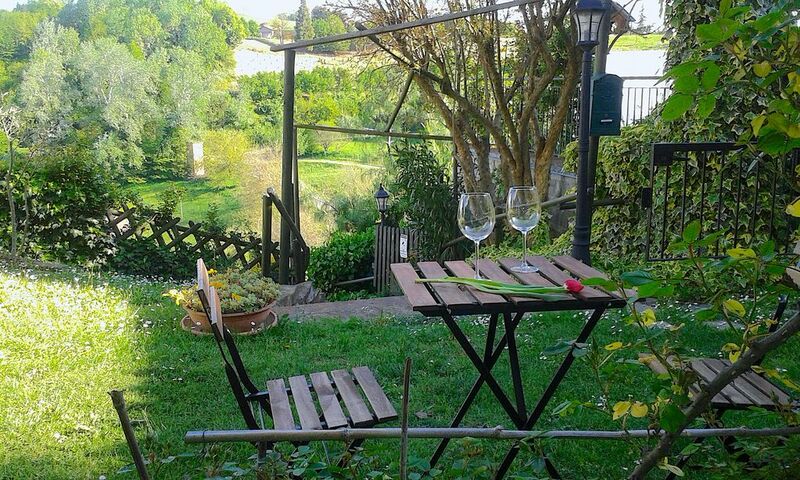 Warm and welcoming country house with small garden and breathtaking view over Piemonte’s hills, declared a UNESCO Human Heritage site - ideal for 2-4 people. Located in the centre of the particular village of Calamandrana Alta, a couple of steps away from the town’s castle, adjacent to a free car-park. 6th century house, independent on three sides, precisely renovated and equipped with every comfort in a cozy and romantic atmosphere. It is located on the hillside of the peaceful village of Calamandrana Alta, in the heart of the Piemonte wine area: Langhe and Monferrato. - second floor: bedroom with kingsize bed (convertible in twin beds) and small panoramic terrace; bathroom with shower and hairdryer. - living room: sofa bed for 1 person. Being the staircase quite dangerous, to guarantee maximum security, we advise access to children aged 4+ or babies who still cannot walk or crawl. - baby cot with blankets (to be requested previously, when doing the reservation). A car is necessary and there is a free car park next to the house. Guests have access to the entire property. Check-in: from 3 p.m. onwards. If check-in/out times are to be changed it is to be noticed when the reservation is made. In order to ensure public safety, italian law obliges hosts to communicate guests’ personal data to the Police. For this reason guests are requested to send by e-mail or bring upon arrival a copy of their IDs or passports for registration (for all people included in the reservation). - You can’t host more people than registered. - Even though we love them, animals are not admitted. - Respect for the neighbourhood at nightime. - Recycle using the provided bins. - Taking care with switching off lights and closing carefully entrance doors when out or when sleeping. - Please don’t steal anything. - Respect our house and take care of it as your own. You are welcome to contact us if anything is needed. On arrival you will find a welcome book, containing all of the house’s information that is needed and also suggestions to discover our territory. Calamandrana Alta is a great starting point for visiting the Langhe-Roero and Monferrato area, declared in 2014 a UNESCO Human Heritage site for its vineyard landscapes: surrounded by beautiful and carefully cultivated hillsides, antique towns, castles, ect. Beautiful winegrowing sites of Piemonte that bear testimony to a deep and long-established relationship between man and his natural environment. These areas are well known for excellent wine production of international quality such as: Barbera d’Asti and Il Nizza, Asti Spumante, Barolo and Barbaresco. Nonetheless Piemonte has also a great cooking tradition, strong flavours and delicate pleasures of old recipes. A territory that offers tasty meals, typical products and plates based on local products. Marco, who is a bike lover, will be happy to advise you the best paths to enjoy our beautiful landscape. This is a PRIVATE RENTAL FOR TOURISTIC PURPOSE according to Italian Law No 431 of 1998. At the check-in time is due to sign the rental agreement for touristic use. During the stay the host will not provide food and beverages, surveillance services, daily cleaning of the house. CHIARA and MARCO We love travelling around the world, discovering new cultures and knowing nice people. We look forward to welcoming our guests and to making their stay unforgettable. You are welcome! Bathroom with bidet, shower and hairdryer. There is a free car park next to the house. Nice house. Friendy owners. Clean. Easy to go by train to genua en torino. In het hoogste gedeelte van Calamandrana vlak onder kasteel en kerk staatv een lieftallig huisje met alles wat je voor twee mensen nodig hebt om in het zuiden te verblijven. Comfort is ok, uitzicht eveneens en de lacatie is prima. In de omgeving valt er van alles te bezichtigen, dus toplocatie!! I proprietari sono ospiti veramente buoni e calorosi. La casa è situato in un borgo alla cima del paese Calamandrana. è un posto verde, un bello e piccolo giardino con una bella vista sulle colline piemontesi. Il soggiorno,la camera e la cucina sono ben arredati e comodi. Charming location with stunning views. The surroundings are also very enjoyable. More than adequate facilities and a lovely hostess. Long people need to be carefull with manoevring in the bathroom, since not everthing is laid out to the length of north european people, but one can overcome this little hurdle. Sehr freundliche und aufmerksame Vermieter, herzliches Willkommen mit regionalen Köstlichkeiten und Weinen. Geschmackvoll renoviertes Haus, auf 3 Ebenen für 2 Personen. Bezogenes Bett mit Leinenbettwäsche, Handtuchwechsel und persönlichem sehr aufmerksamen Service der Vermieter, die im nächsten Städchen wohnen. Kleiner Gartenanteil, mit kleiner Terasse, Tischchen, auf Tuchfühlung mit den Ital. Nachbarn, die nicht immer Rücksicht auf die Privatsphäre nehmen. Sehr schöne Aussicht vom Balkon im oberen Stockwerk, dort Schlafzimmer mit Bad+Wc, etwas viel Treppensteigen erforderlich. Man kann vom Haus aus kleine Spaziergänge in die schöne Umgebung machen und hat gute Ausflugs- und Einkaufs Möglichkeiten in kurzer Fahrdistanz. Ideal für einen aktiven Urlaub, um das wunderschöne Piemont zu entdecken. It was a privilege to stay in this beautifully renovated house, ideally located for exploring Piemonte. The setting was perfect for us: rural enough to have a quiet break with breathtaking views of the valley, and yet close enough to drive to major destinations such as Alba, Asti, Turin, Barolo and Bra. The house is one of the nicest places we’ve ever stayed. A medieval building immediately beside an ancient church, the house has been lovingly restored and decorated in modern, stylish taste. The kitchen was equipped with most things we needed, and we prepared meals at home most nights, using up the truffle we bought in Alba and the wines discovered on our journeys. Chiara made us feel most welcome on our arrival; the added touches of local wines and homemade apricot jam and cake made us feel instantly at home. On the middle floor, there is a comfortable sitting room with television that we never used, preferring instead to spend our time upstairs or down. We ate our meals in the small garden – the weather was mild enough even in late October – however, the multitude of timer-activated garden lights meant that there was little chance of stargazing and there was little privacy due to the comings and goings of the neighbors living close by. Nevertheless, everyone was friendly enough and it did truly feel like we were living as the locals do. One of the previous guests wrote in the guestbook that they were taken out dancing by the family next door. Carpe diem! The bedroom had a comfortable bed and wardrobe large enough for a week’s worth of clothes. The star attraction in that room was the balcony window, which we left wide open all night and from which we could watch the sun rise and set. We sat on the balcony every night with a glass of grappa, a blissful experience. The area seemed completely insect-free, so windows were left wide open when we were at home. The bathroom was modern and clean and many complimentary provisions were supplied. Europeans will be delighted with the bidet. The glass ceiling that Marco created to separate the bathroom from the ancient timbered roof above was a marvel of design. One real advantage to this place that wasn’t made clear in the write-up beforehand was the ideal parking very close to the house. The walk to the car was indeed short. It was a lovely place to stay and a wonderful base for exploring things both near (the excellent pizzeria in town) and further afield. I’d definitely return. The house is located on the hillside of the peaceful village of Calamandrana Alta, in the heart of the Piemonte wine area: Langhe and Monferrato. It is a great starting point for visiting the Langhe-Roero and Monferrato area, declared in 2014 a UNESCO Human Heritage site for its vineyard landscapes. This site covers five distinct winegrowing areas and one castle, emblem of profound and ancient expertise reflecting the relationship of man with his environment. They express a slowly refined association between a diverse range of soil types, grape varieties that are often native, and suitable winemaking processes. They offer panoramas of carefully cultivated hillsides, following ancient land divisions punctuated by buildings which provide structure to the visual space: hilltop villages, castles, Romanesque chapels, farms, ciabots, cellars and storerooms for the cellaring and sale of wine, notably in the small and larger towns on the margins of the vineyards. The site is outstanding for its harmony and balance between the aesthetic qualities of its landscapes, the architectural and historic diversity of the built elements associated with the vineyards and viticulture, and an authentic and ancient art of winemaking.